An exceptional A-Frame style June Lake cabin rental at the base of Carson Peak with views of the Ansel Adams Wilderness. Come to June Lake and surround yourself with the beautiful High Sierra Nevada Mountains, crystal clear alpine lakes and a wonderful vacation experience. Our town is a small town, located between Yosemite National Park and Mammoth Lakes that has four seasons of fun and relaxation. Discover the Fall colors, perfect winter powder, and trophy Brown Trout. Come and stay in one of our exceptional A-Frame style June Lake cabin rentals at the base of Carson Peak with views of the Ansel Adams Wilderness. From this cabin rental, ski off the back deck into an exceptional cross-country skiing experience. If you want ski lifts, there are none here. Just pure mountain white powder and fantastic cross-country. This is the purest form of ski-in ski-out. This specific location is named after the historic ski slope with a rope tow that no longer exists. 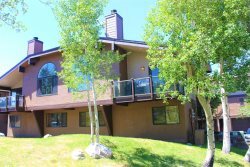 Four Seasons is located between Silver Lake and Gull Lake along June Lake Loop. If you are looking for a normal ski hill with lifts, head to June Lake Mountain 1 mile down the road. In the Winter, many people hit the slopes of June Lake Ski Area, but for a true ski-in ski-out, stay just down the road in one of these A-Frame cabin rentals and enjoy cross-country skiing with a pure ski-in ski-out experience. In the Spring and Summer, hikers of all experience levels have a wide selection of hiking trails to choose from. Here are our favorite trails. And when it comes to large trout, the June Lake fishery is one of the best Brown Trout resources in the country. We grow'em BIG here. And you'll simply love our Fall colors. Definitely plan on spending time in June Lake during the Fall months. Walking into these cabins you will feel right at home. To the left is a bedroom with a queen bed then it opens up to the living area with kitchen, dining tables, and living room. From the living room there is floor to ceiling glass that lets you view the wilderness and mountainside. Going up the stairs from the living room is a loft with 3 single beds. The simple mountain pleasure of these cabins is what keep bring folks to June Lake. The team members were very helpful and kind. We loved the property and will definitely be back. The woman who checked us in was very friendly and gave us some tips to help us enjoy our time in the area. I love the location and the feel of the cabin, incredible views! If the beds get replaced I would stay again and highly recommend. If the beds would have been better my ratings would have been higher but a good night sleep is very important. The girls were great. We called for wood and they promptly brought us more. Very cool. I first stayed there in the mid 90s when Ron owned the place. I've been yearning to return ever since! Finally it is opened again and we were able to book it during spring break. It truly is a special place and we will certainly come back soon! Thank you for accommodating our very late arrival. It was a great, relaxing trip. Everyone was very affable and professional. They were very helpful and courteous. I hope to return to the Four Seasons in June Lake. My wife and I really enjoyed our sierra sojourn. Next time, we would like to stay even longer. June Lake Accommodations staff are very nice. Enjoyable stay for the most part in a very beautiful location. Cabin is a bit on the rustic side and showing its age. Cozy for a family of 4.